This blog post is a bit different because it has been raining for the last few days; so I didn’t take a lot of pictures. 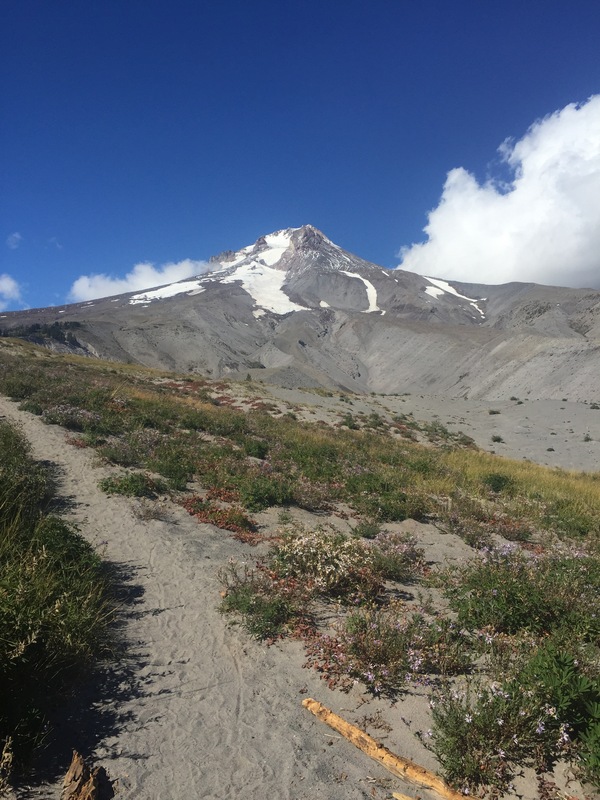 Day 120 was flat and cold, and we powered through for a big climb up to Timberline Lodge the next day. The lodge sits near the summit of Mt. Hood, and we made it in time for dinner. We camped nearby, and the next day went in for the buffet breakfast. We spent 3 hours at breakfast, chatting with other hikers (and eating!!!). After breakfast we hiked by Ramona Falls, and enjoyed some sun for a change! 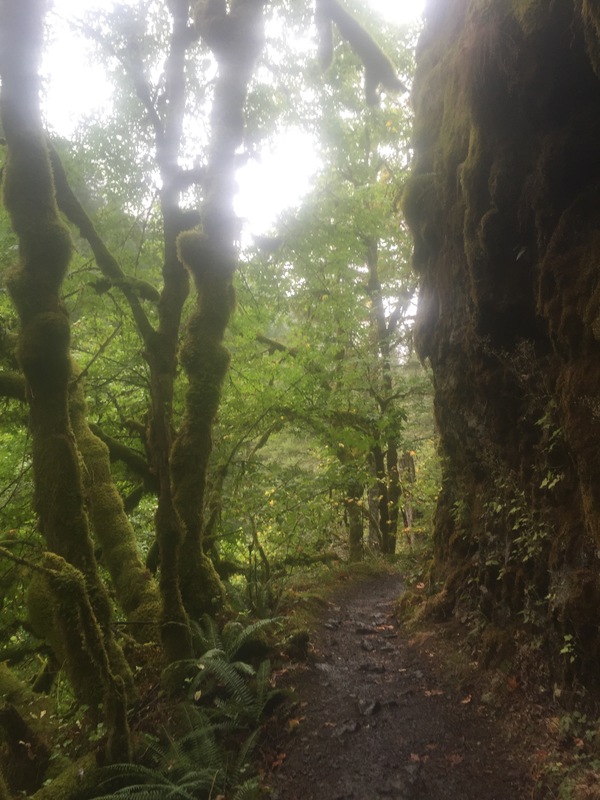 The next day we were 31 miles from the town of Cascade Locks, and thought we’d hike a regular day then a short day to get in; however, we awoke to a cold steady rain. We ate breakfast in the tent, and got going a little later than usual. The rain didn’t look like it would clear, and it got worse as we hiked on. 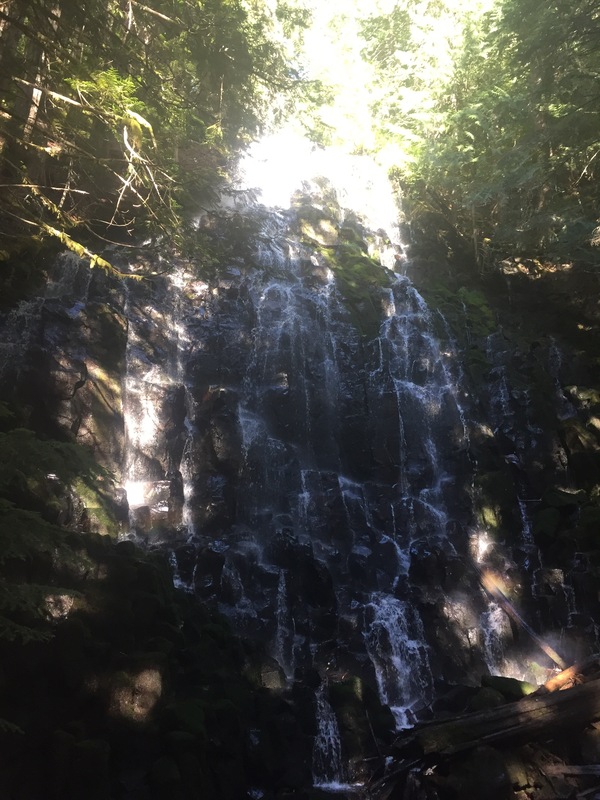 We took minimal breaks, and by 2pm realized we’d already hiked 16 miles and that we had a chance to make Cascade Locks by nightfall. We started downhill, and as we got out of the clouds the rain stopped. We passed by many waterfalls, and even by one you could walk behind. We made it by 8pm, and feasted at the local burger joint before checking into a hotel. 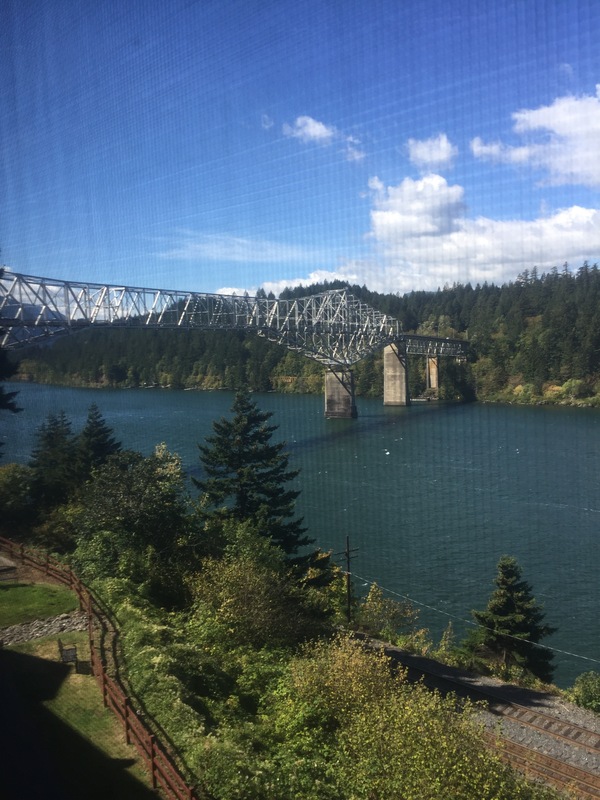 We spent the next day in Cascade Locks, and enjoyed the rest day! Tomorrow we walk into Washington across the Bridge of the Gods. 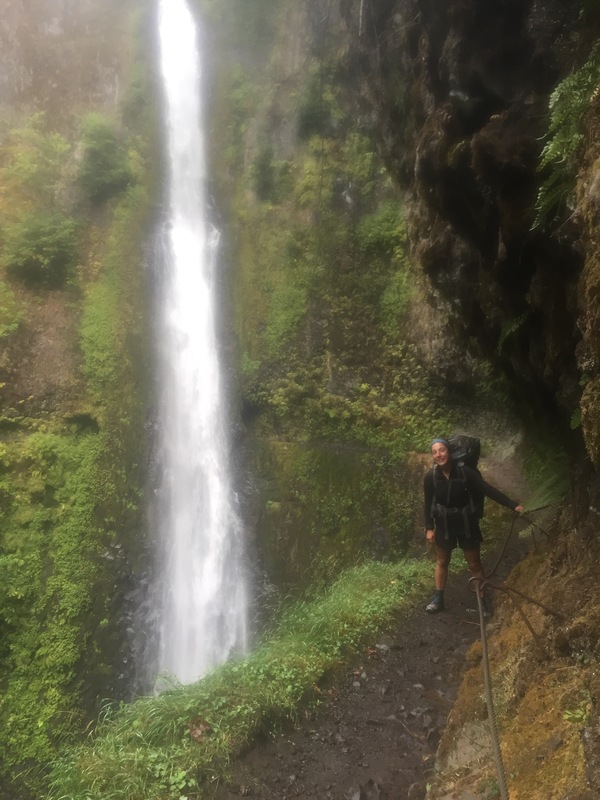 Blog posts may be sporadic through Washington, as the next 505 miles to the finish are remote and I don’t have much hope for good cell phone service; but we’ll blog when we can! Just commented the other day to Linda that it seemed like you guys had experienced very few wet weather days. The law of averages seems to be catching up with you toward the end. Wishing you nice weather for the Washington segment. Thanks! We just hit some more heavy rain, but it the extended forecast looks promising for the final push to the border. Hopefully the weather holds! Take care,you two! Happy trails 🙂 All the waterfalls look really pretty. What an amazing journey!! Thanks! It was a gorgeous hike. I was just telling Garrett when we get back to town that we may have to stop at your shop before going home! This has been an amazing journey to follow. Thanks for posting as frequently as you have. We’ll see you in Pittsburgh in October I understand. Yep! We hope to be able to join the Tuesday lunch! You guys are amazing! It is hard to imagine hiking in all that weather you have met!! Ah youth! But, I also imagine the views are spectacular and the experience very rewarding. 500 plus miles to go!!! I look forward to your next Blog! Thanks, Kathy! It’s hard to believe the hike is almost over- the blog has been a great way to remember it all! Great photos! Chris and I stayed at the Timberline Lodge, built as a WPA effort, many years ago because we wanted to ski in July, which you can do on Mt Hood, which has the only glacier in the lower 48. Did you know that the exterior shots in the Shining were at the Timberline? I am still pining for your vegan pancakes.